Esperanza Spalding announced that she will host and perform at a benefit concert for Free the Slaves, a human rights organization dedicated to eradicating slavery and human trafficking worldwide, at City Winery in New York City on Tuesday, December 4 at 8:00 pm.She will be joined by an exciting lineup of musical friends. In addition to vocalists Bobby McFerrin and Gretchen Parlato - along with other special guests to be announced soon - she will incorporate two groups for the show: a jazz quartet and the Chamber Music Society band. In addition to a live auction and merchandise sale, various ticket levels will be available, including a VIP meet and greet with Spalding. 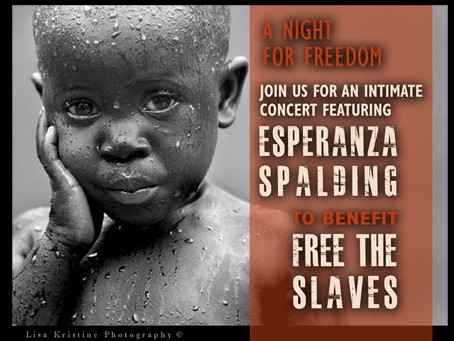 100% of ticket sales, live auction items, and merchandise will go to Free the Slaves this special evening.